I have a customer seeing a very strange eConnect issue on GP 2016. They are importing PM Manual Payments, and the manual payment imports fine, but in one of their GP environments, the Manual Payment does not have any distributions. By this, I mean that there are literally NO distribution records--not just empty distributions with no GL accounts. The only way I've been able to reproduce this is by submitting CREATEDIST = 0 to eConnect, without sending in any distributions with the transaction. However, I have reviewed the customer's XML, and they are not setting CREATEDIST at all, so eConnect should be defaulting that value to 1 and automatically creating the distributions. If they run their eConnect PM Manual Payment integration against a different GP environment, the distributions are created properly. And they have also tested an eConnect Manual Payment import that I developed, and when they run that in their 'problem' environment, the distributions are not created. So the issue does not appear to be with their import, but with the GP environment. They have run the GP Database Maintenance Utility to recreate all stored procedures, but that didn't help. I've even sent them the scripts to recreate the eConnect stored proc scripts for the PM Manual Payment and PM Distribution procs, but that didn't help either. We've checked the Pre and Post eConnect procs, but we do not see any custom scripts in those procs. I've checked to see whether blank / missing default posting accounts would cause this, but they don't appear to. Even if I remove all default Payables accounts from the vendor, checkbook, credit card, and company, eConnect still creates the distribution records--they just have blank GL account values. Has anyone seen this before? Or any thoughts on where to look for clues? Many thanks to @Donny Kensmoe for identifying the cause of this issue! 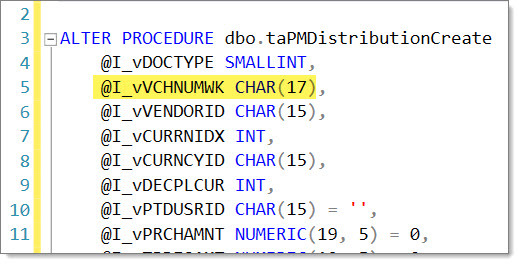 The problem is due to an eConnect bug in the taPMDistributionCreate stored procedure, which truncates the "voucher number" value to 17 characters. However, in addition to this, the problem may be specific to certain payment types, specifically Credit Card payments. When importing Manual Payments of type Credit Card, no error is reported or returned by eConnect, and the payment is successfully created even though the distributions failed to get created. 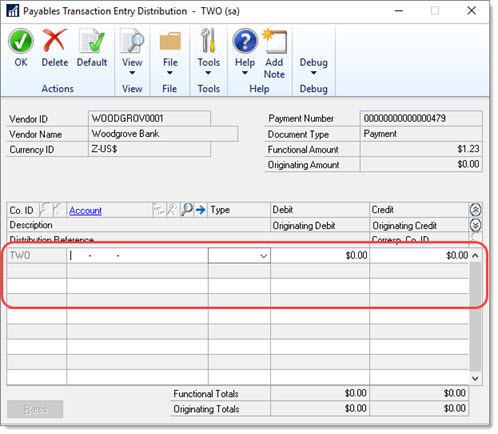 However, my customer reported that if they imported a Manual Payment of type Check with a 20 character payment number, eConnect DID return an error (duplicate key error, because the truncated payment number just happened to match an existing 17 character payment number), and the Check payment insert failed. So in addition to the CHAR(17) bug, it seems that eConnect is not properly raising an error when distributions fail for Credit Card payments.